Facebook’s Internet.org group has kicked its mission to provide global internet access up a notch after announcing the launch of its first app in Zambia, Africa. The app provides “basic access” to 13 different services — including Facebook, Facebook Messenger, Google search and Wikipedia — for free. 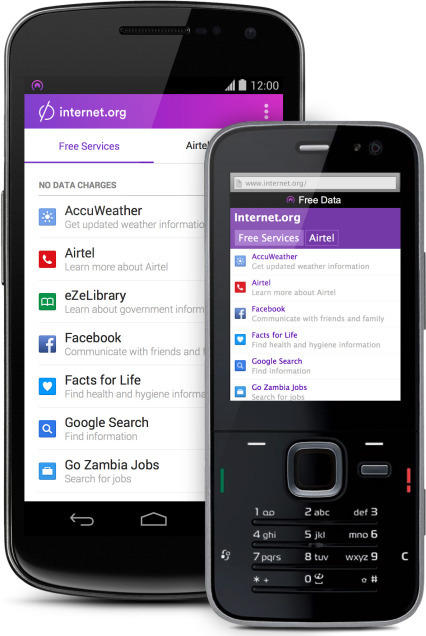 Customers of Zambian operator Airtel will be the first to get their hands on it, but Facebook plans to continue to develop the experience and introduce the app in other markets in due course. “With this app, people can browse a set of useful health, employment and local information services without data charges. By providing free basic services via the app, we hope to bring more people online and help them discover valuable services they might not have otherwise,” the company said in a blog post. While this is far from the first deal that offers free access to services, it is notable for the significant tech industry backing that Internet.org has, and for the fact that the service will be free to users forever — unlike other ‘free data’ deals which are limited to trial periods. Facebook says less than a third of the world has access to the internet, which makes its efforts with Internet.org — which was founded last year — potentially ground-breaking. The group’s first pilot initiative earlier this year saw educational materials provided to smartphones in Rwanda, another African country.